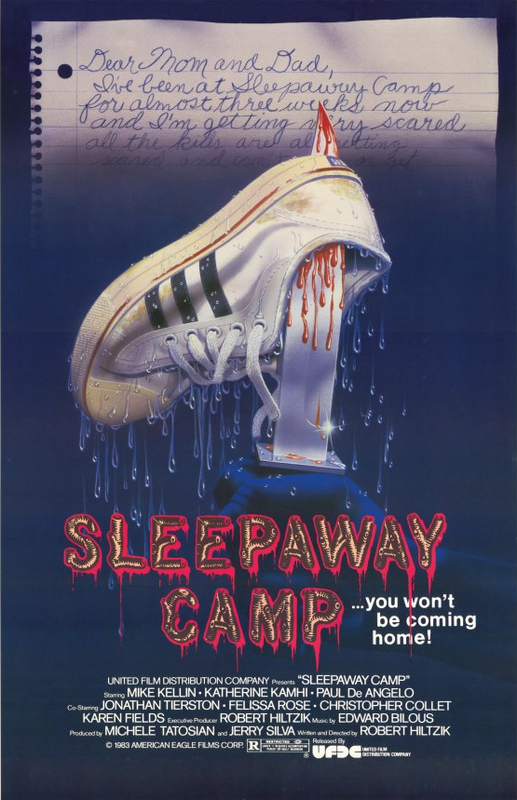 Sleepaway Camp is certainly a half accurate title in that Robert Hiltzik’s early 1980s slasher debacle has its fair share of camp, and in a way is a little confused as to what it wants to be. Although entertaining enough, it would appear that much of the film has lost a great deal of its edge over the past 30 years, making it come across as a tad goofy in the present day. However, the harrowing and shocking ending Sleepaway Camp unleashes goes a long way to reclaiming that lost tension. Set during summer camp at Camp Arawak, the film follows a group of campers who fall victim to a series of seemingly unprovoked, random murders at the hands of an unknown assailant. In particular, events zone in on the experiences of Angela, a slightly disturbed and mysterious girl who lost her father and brother in a boating accident eight years prior. Sleepaway Camp has garnered a distinct cult following since its release, much of which is a product of the film’s alarming ending. Without a doubt, the final scene is completely left-field and gives Sleepaway Camp a much-needed shot in the arm, as much of what comes before is a tad underwhelming. It is difficult to decipher which direction Robert Hiltzik intended to take the film, and how he wanted it to be perceived back in 1983, but thirty years south of its release it certainly veers closer to camp than creepy. That is not to say that it is a bad film, but for around seventy of its 88 minutes on-screen, it does not exceed the passable mark. To its credit, Sleepaway Camp is fairly inventive when it comes to the murderer’s methods of killing, without bumbling over towards silly. The film was making its way into cinemas just as the slasher horror genre was entering a period of down-time — between the likes of John Carpenter’s masterful Halloween in the late-1970s and the slasher re-emergence through genre pioneers such as Scream in the mid-1990s. Sleepaway Camp does well, therefore, in its attempts to be creative at a time when many of the products the genre was producing were uninspired. However, it is unable to avoid some of the usual potential genre pitfalls. The dialogue is often rash and lacking in any efficiency, often taking a back-seat to the narrative itself and seemingly driven by unwarranted and lazy bouts of profanity. The production values are also inconsistent, with some of the visuals looking especially disgusting (in a good way), whereas others go overboard on the goofiness — another example of the film being confused as to whether it wants to be treated in a serious manner or whether it’s not taking itself too seriously. None of the cast in particular stand out and, as previously mentioned, they are not given the greatest script to relay and exchange with one another, meaning many of the performances are forgettable. With that being said, Mike Kellin, who has a supporting role as the camp overseer, is eccentric and at times vaguely humorous in his role. Felissa Rose, who plays the main character Angela, is not given an awful lot to do, and as a result does not offer a lot more than a lifeless performance for much of the film — this has more to do with her character being poorly written than her actual performance in all fairness. However, she is the central figure of the best and most unnerving scene in the entire piece. Other than that, the nice characters are nice enough and the nasty ones are nasty enough, generating a bog-standard, clichéd feeling amongst the group of campers. Even though much of the film is vaguely enjoyable, with some nifty character disposals for its time, a significant percentage of the goings-on are nothing more than just okay. It should be noted though that the main selling point of Sleepaway Camp (which, incidentally is an unjustified title) is the ending which it boasts, and it is true the finale gives the output a dose of essential last-minute energy to make the overall film a worthwhile watch.